We hope you will find it useful and informative. Lismore & District Financial Counselling Service is based in Lismore and has been providing free, confidential financial counselling since 1990. 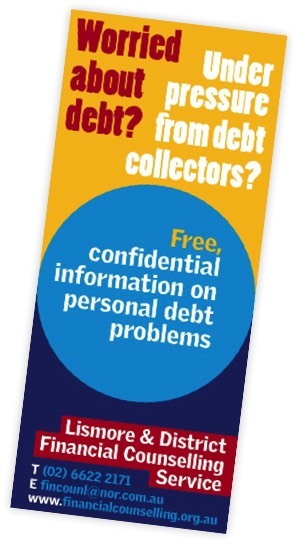 All of our financial counsellors are based in our local community and provide high quality, professional, confidential and free accredited financial counselling to people experiencing severe financial difficulties due to their personal debt issues. Our financial counsellors are accredited with the Financial Counsellors Association of New South Wales (FCAN) and hold a diploma in financial counselling. Our qualified professional staff receive ongoing training and supervision to allow them to assist you make those difficult decisions you face in times of financial stress and hardship. Our counsellors won't tell you what to do, we will help you look at the options available to you and can offer you support when you decide which option to pursue. We will help you understand the implications of these options for you and your family. We do not receive any money from banks, credit providers etc so we are able to act independently and without conflict-of-interest. We do not distribute emergency relief, charitable assistance or electricity vouchers.